New Jersey Ave. and East Miami Ave. In the era before trains, trucks and modern highways were invented, ships were the main method of transporting goods over distances. The waters around Cape May and the Wildwoods were of strategic importance in the Revolutionary War because they are at the opening of Delaware Bay. In 1776, Philadelphia served as the American capitol, and the only water path to Philadelphia from the Atlantic Ocean is through Delaware Bay into the Delaware River. Because of this, the British set up a naval blockade of Delaware Bay early in the war to prevent ships from sailing to Philadelphia with war supplies. 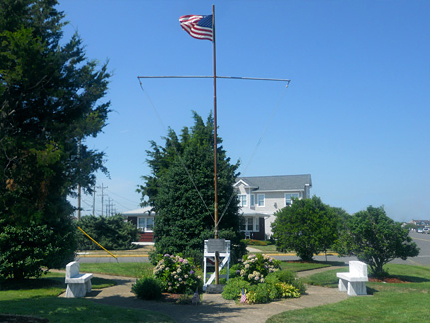 Two British warships, the Kingfisher and Orpheus, were blockading the entrance to Delaware Bay. Upon sighting the Nancy on the afternoon of June 28, the two British warships pursued her. Unable to enter Delaware Bay, the Nancy headed towards Turtle Gut Inlet. A fog came in over the water as the sun was setting, and they lost site of the Nancy. The fog lifted in the morning, and the British warships closed in to attack the Nancy. The Nancy was anchored a distance from the shoreline of Turtle Gut Inlet. The small eleven-man crew of the Nancy attempted to save the war supplies by carrying them on to the shore, while at the same time returning cannonfire to the attacking British warships. The Nancy's captain, Hugh Montgomery, decided it was best to run the ship into the shoreline of Turtle Gut Inlet. Although this could damage the ship , it would give them some distance from the British ships, and it would also make it easier to carry the supplies to shore. Three American vessels in the area, the Lexington, the Wasp, and the Reprisal, came to the aid of the Nancy. Some of the crewman of these vessels rowed out to the Nancy on smaller boats, and they assisted with the carrying of supplies and manning the cannons. When about two-thirds of the supplies had been carried ashore, Captain Montgomery determined that the Nancy could no longer hold out against the British vessels, and he had the crew abandon the ship. Montgomery decided to blow up the Nancy and the remaining supplies, rather than allow them to fall into the hands of the British. Before leaving the ship, an improvised fuse was created by wrapping gunpowder in the cloth of one of the sails. The fuse led to the main supply of gunpowder still on the ship. It was lit as the men abandoned the Nancy. 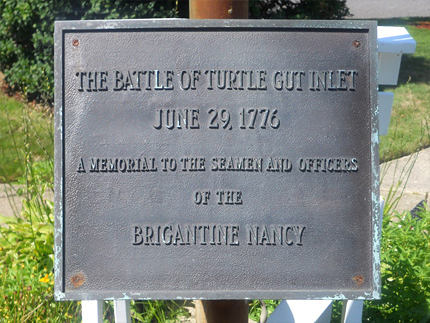 The Battle of Turtle Gut Inlet took place fifteen months after the first battle of the Revolutionary War had occurred on April 19, 1775 at Lexington and Concord in Massachusetts. During those fifteen months, New Jersey had not been very affected by the violence of the war on its own soil. The gruesome scene of limbs and dead bodies washing up on the shore at Turtle Gut Inlet was an early look at the horrors of war for the local citizens. Unfortunately for the people of New Jersey, the realities of living in a war zone were soon to become all too familiar. Six months after the Battle of Turtle Gut Inlet, the British invaded New Jersey at Alpine, while the Continental (American) Army was at Fort Lee. From that point on, New Jersey would be at the center of many events throughout the rest of the war. Battles, skirmishes, raids, and military encampments would become a regular part of life in the state until the war ended. There are controls on the image to allow you to zoom in. When you zoom in on the Wildwood area, Two Mile Beach, Five Mile Beach and Turtle Gut Inlet are all labeled on the map. ▸ "Aspects of New Jersey Geology – 2009 The Jersey Shore"
Page 2 shows aerial photos from 1920 and 2002 showing Wildwood Crest before and after Turtle Gut Inlet was filled in. ▸ NOTE: The writers of the two above letters are unidentified. It was common for newspapers at the time to print excerpts of letters about newsworthy events without identifying the writer. In this case, there are enough similarities in the two letters that they appear to have been written by the same person. While the July 6 letter is listed as appearing in the Connecticut Courant, the American Archives does not identify the newspaper in which the July 5 letter appeared. ▸ Elizabeth Montgomery was the daughter of Captain Hugh Montgomery. In this book, she gives a five-page account of the events related to the Battle of Turtle Gut Inlet. She presumably received some of her information from family tradition about the life of her father. It should be noted that Captain Montgomery died in 1780 when Elizabeth was only an infant (see page 158). So Elizabeth was writing seven decades after Captain Montgomery's death, and she could not have heard the stories from him firsthand. At least some of her information came from the descendants of Joshua Griffin who was wounded in the Battle of Turtle Gut Inlet. Griffin and his family were from Wilmington, and she states on page 157 that Griffin's "father was an old and worthy townsman, whose descendants are still here, and remember the circumstances of this narrative." Elizabeth Montgomery gives an entertaining account of the Battle of Turtle Gut Inlet, but it does have an ex age rated and dramatized feel at times, which one might expect in a story drawn from family traditions. 3. ^ The "Extract of a Letter Dated Philadelphia, July 5, 1776" describes the cargo of the Nancy as, "three hundred and eighty six barrels of gunpowder, fifty firelocks, one hundred and one hogshead of rum, and and sixty -two hogsheads of sugar, &c."
The "Extract of a Letter Dated Philadelphia, July 6, 1776" describes the cargo of the Nancy as, "400 barrels of powder, 50 or 60 small arms, dry goods, 101 hogshead of rum, and 62 hogsheads of sugar." Letter from Captain Lambert Wickes to Samuel Wickes states that the cargo consisted "of Powder Arms Rum Sugar & dry Goods." 4. ^ Quote from the "Extract of a Letter Dated Philadelphia, July 5, 1776"
▸ The actual total of British dead from the explosion may have been lower than this letter suggests. The captains' journal entries for the British warships Kingsfisher and the Orpheus both record the number of British dead as seven. ▸ The "Captn Barry" referred to in this letter was John Barry, the captain of the Lexington. Barry would go on to have a lengthy and successful naval career. He is often referred to as the Father of the American Navy, and is recognized as the first flag officer of the United States Navy. ~ H. J. Res. 38 / 109th Congress of the United States of America. Available as a PDF on the U.S. Government Publishing Office website here. • On page 157 of Reminiscences of Wilmington, Elizabeth Montgomery identifies the American who was wounded in the battle as Joshua Griffin, a native of Wilmington.